What are Semi-Pneumatic Casters and Why Do Shipping Yards Use Them? If you were asked what a pneumatic caster was, you could probably hazard a guess. It’s likely that you know what a pneumatic wheel is, so surely a pneumatic caster operates upon a similar principle. Well – you would not be wrong if that were your assumption! But, what’s a semi-pneumatic caster? And what’s the difference between a pneumatic caster and a semi-pneumatic one? And why do shipping yards often use pneumatic casters? Read on and you’ll find out the answer to all of these questions! First of all, let’s clarify if you fully understood what is meant by ‘pneumatic’. Anything that is pneumatic is an item that uses pressurized gas or air (this is different from hydraulics, in which a liquid is used). The term was derived from the Ancient Greek word for air, which was ‘pheuma’, which in turn was derived from the Greek word ‘pnein’, which meant breath. The word eventually found its way into French, where it became ‘pneumatique’. The pneumatic tire was invented in the 1840s by Scot Robert William Thomson. Prior to the pneumatic tire, all carriages and vehicles used solid wheels that led to many uncomfortable journeys for vehicle passengers, particularly over rocky or uneven terrain. Originally called ‘Aerial Wheels’, the tire used a cushion of air between the wheel rim and the surface upon which the wheel was traveling. Pneumatic casters work in exactly the same way. They even look like mini tires, allowing for easy maneuverability of the items they are attached to without any loss of performance. So, that’s pneumatic casters. What about semi-pneumatic casters? Semi-pneumatic casters look almost identical to pneumatic casters, and indeed they serve the same purpose, but they are a bit different. The walls of a semi-pneumatic caster are a lot thicker than the walls of a pneumatic one, but there still is a hollow area. This hollow area though is not under pressure, meaning that a semi-pneumatic caster does not require inflating. This ‘hollow’ characteristic though does provide cushioning, and as a semi-pneumatic caster requires no inflation, it means it cannot be punctured. Despite the advantages of semi-pneumatic casters, not all tires are suitable for all applications, but semi-pneumatic tires can be found on all types of vehicles and items of equipment. There are numerous benefits of using semi-pneumatic casters. Perhaps the number one benefit is the ability of semi-pneumatic casters to absorb shocks and bumps. The tires act as a natural cushion between the road surface (which may be uneven or covered with debris) and the items that are being moved on casters, or transported. If you are using semi-pneumatic casters on trolleys to transport items around your warehouse or facility, then any items you are moving around will be protected, and will be much less likely to suffer damage should you be using ‘harsher’ type casters. Semi-pneumatic casters are also very versatile, as they can be used both internally and externally without any issues. If you are habitually using equipment that moves from an internal environment to an external one, then semi-pneumatic casters will be ideal. 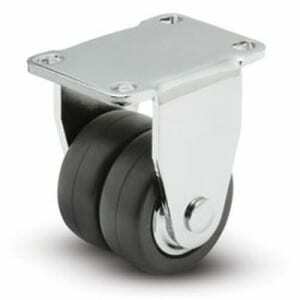 These casters work especially well when they are moved over rough or rocky terrain, or when they have to be mounted up onto sidewalks from the road. One other benefit of using semi-pneumatic casters is the fact that they are very quiet to operate. If your employees work in an environment where noise can be an issue, then you will not want to add anything to the noise levels your employees already encounter. With semi-pneumatic casters noise is kept to a minimum, and there’s not the dreaded ‘squeak’ of rolling casters that’s prevalent in wheels made from hard plastics, or even rubber. Casters and debris is always a problem in working environments too. During the day, your production work may become littered with debris that you cannot keep under control. This is not a problem with semi-pneumatic casters as they stand half way between true pneumatic casters and plastic or metal casters. Semi-pneumatic casters will roll over most types of debris with ease. There is the problem of objects becoming embedded in the casters, but such objects usually can simply be removed with minimum damage to the wheel. This is unlike pneumatic casters where a sharp object may cause a puncture, rendering the caster useless until it can be repaired and re-inflated. It’s not all good news with semi-pneumatic casters, although the majority of it is positive. Because of the ‘softness’ of the wheel it can be hard to set items on casters in motion. This is because of the relatively large surface area of the wheel, and the fact that the caster is not one hundred percent rigid. If you have swivel-mounted semi-pneumatic casters then maneuvering the object upon which they are installed can be an issue as well. These are relatively minor issues though that does little to reduce the overall benefits of semi-pneumatic casters in any significant way. Where are Semi-Pneumatic Casters Mostly Used? Finally, as we mentioned in the title of this piece, shipping yards are the number one place in business where semi-pneumatic casters can be found working. This is because the needs of a shipping yard are generally heavy duty, which means that plastic casters are not resilient enough to meet with the demands expected of them. There is also likely to be a lot of debris around, and conditions may become quite tough at times. Semi-pneumatic casters have the strength, versatility and resilience to be able to cope with all that is thrown at them. Whether your company works in a shipping yard or not, our team at Douglas Equipment has the ability to address your needs, thanks to the products that we stock – including of course semi-pneumatic casters. Just give us a call to see what we are able to do for you. You can call us toll free at 1-800-451-0030, or at 305-888-3700 if you are based in the South Florida area. You can also contact us online using our web form if that’s more convenient.